Classy art deco design combines with some innovative extras in The Grand, a highly volatile video slot from Quickspin. Played using a 6 reel, 214 ways to win machine, it comes with a trio of modifiers that can strike at random to sync between 2 and 6 reels, add up to 3 reel nudges or deliver between 4 and 8 extra wilds. Trigger the free spins round and GRANDomizer can add up to 3 of those modifiers with potentially spectacular effect. Play on your PC, tablet or mobile from between 10p and £100 per spin. There’s a classy feel to the design here. The action takes place on a 3x3x4x4x5x5 game engine which deliver 214 ways to win. You’ll see heart, diamond, club and spade symbols as well as a pair of jewels. The best payer is the green gemstone which will get you 0.5, 1.1, 2, 4 or 8 times your bet if you land 2, 3, 4, 5 or 6 on adjoining reels. Synced Reels feature – between 2 and 6 reels can synchronize to show the same matching symbols.Random Wilds feature – anything from 4 right up to 8 wilds can be added at random to the reels. These can appear anywhere apart from reel 1. Nudge Reels feature – you could see up to 3 reels nudge up or down to create an improved combination and hopefully a payout to match. Those modifiers can also appear in the game’s Free Spins Bonus feature – this is triggered by landing 3, 4, 5 or 6 Bonus symbols on the same spin. Your reward is 6, 9, 12 or 15 free spins. Hope to see the Bonus symbol land on all 3 of the middle 3 reels on the same spin as this activates the GRANDomizer feature – this awards 1 of the Sync, Wild or Nudge modifiers for the rest of your free spins. It also adds another 1, 2 or 3 free spins to your tally. It’s possible to activate the GRANDomizer feature more than once so you could end up with all 3 modifiers live on each free spin. Look out when that happens! 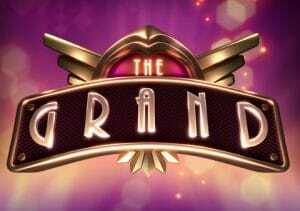 The Grand is a super high variance video slot so you can expect some big swings to your bankroll. Expect lengthy winless runs. It’s possible to win big from a single spin though – up to 2,901.5 times your bet on each spin. We really liked The Grand. There’s a suitably classy look to the visuals and the unusual gameplay delivers something a little different. Throw the high volatility into the mix and The Grand becomes well worth investigating. I recommend you try other Quickspin titles with Divine Dreams a favourite of ours.